Get Geared up to Cycle Across America – Go Bicycle Touring! It’s Memorial Day weekend and that means bicycle touring season is officially in swing. If you’re still in need of a little nudge to get your bum off the couch and into the saddle cycling across America, head on over to America ByCycle. The enthusiastic duo behind the site, Los Angeles-based journalists Ryan McAfee and Michelle Cassel, recently biked across the USA on the TransAmerica Trail. 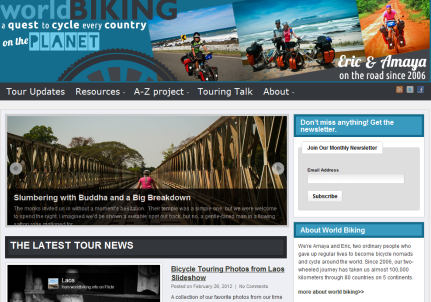 They’ve teamed up with the Adventure Cycling Association to produce a series of videos and entertaining and informative blog posts on bicycle touring across America. A “shake-down” is a term that the AT hikers use when they get rid of unnecessary items to shed some weight and lighten their packs. The hikers take weight very seriously, and will go as far as ripping the pages out of their hiking books as they finish each page. Ryan and I desperately needed a “shake-down,” since we were both carrying around 90 pounds of gear, and we’re about to attempt the hardest climb in the TransAmerica trail. It couldn’t have been a more appropriate time to ship some stuff home. Item by item, pound by pound, Ryan and I painfully threw things away. Fire starters, clothes, a recorder, a sleeping pad that wouldn’t stay inflated, three books, and Ryan’s 7D Canon camera (there was no reason to be carrying two cameras) were some of the items thrown into the pile. When it was all over, we weighed everything on Craig’s scale. Amazingly, we were able to “shake-down” around 21 pounds of equipment. 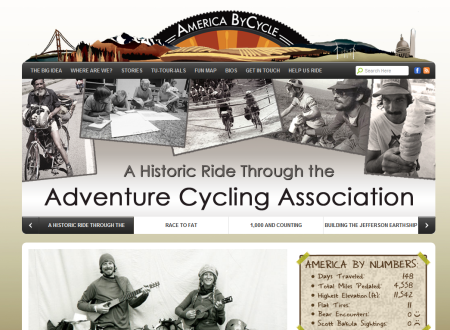 If you’re toying with the idea of biking the TransAmerica Trail in 2012 rush on over to America ByCycle and fill up on some USA cycling inspiration.